Welcome back to Off the Menu, where we bring you the best and strangest food stories from my email inbox. 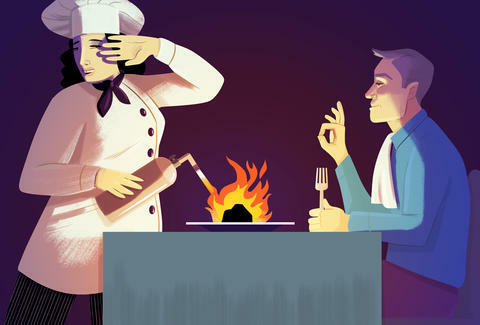 This week, we've got more tales of restaurant customers who ate stuff that absolutely should not have been consumed by a human being. As always, these are real emails from real readers, though names have been changed. "My parents immigrated to the US from China and opened up a Chinese food carry-out in Baltimore, MD. Like a lot of kids of local restaurant owners, I worked there when I was younger. "One time, a guy comes in and asks for pork fried rice, extra dark. People like it salty and dark sometimes, so it isn't an unusual request. I put the order in, he pays, he leaves. He comes back a half-hour later, angry, telling us that it's not dark enough. I mean, it's pretty dark to begin with; picture regular brown (not light brown) fried rice but twice as brown. But I apologize, take the food back, tell my parents, and we offer to make it again. He wants to see it this time before he takes it. "Now keep in mind that when cooking fried rice, we didn't use standard bottled Kikkoman soy sauce. The stuff we used was oil black and a thick, almost molasses-like consistency. I'm not sure what kind of soy sauce it was, but it was black, very salty, and honestly kind of terrifying. "As I sneak around the service station to take a peek at the table, I see him dip his napkin in the sambuca and blot it all over his face and neck." "Fast-forward a couple months, and I'm hanging around the service station on a slow weeknight. As I sat a one-top in my section, my co-worker looks over and her eyes light up, 'It's Sambuca Man!' she says. I'm excited, as I finally get to see what this guy's all about. I go over to his table to greet him, and, as expected, he orders a glass of sambuca. I bring it to him and he orders a steak. As I sneak around the service station to take a peek at the table, I see him dip his napkin in the sambuca and blot it all over his face and neck. He dips and blots a few more times, then puts the napkin down like that was totally a normal thing to do in a restaurant, or anywhere. "A few minutes later, his steak is up and I bring it to his table, then rush back to the service station to creep. Sambuca Man proceeds to dump the remainder of his glass all over his steak, including the little coffee beans the bartender put in the drink. I watch as he finishes his entire plate of sambuca-doused steak and vegetables. "Worse than watching him eat this mess was bussing his table after he left. A sticky lake of sambuca had covered his plate and dribbled down the sides, with an island of napkins congealed in the middle. "My husband and I were at a Russian restaurant, which is a lovely place and we've been more than once, but we still don't always understand what we're ordering because the menu doesn't get too granular on descriptions and also, no pictures on the menu, because it's a pretty classy joint. "We ordered these special mulled fruit drinks to try, each of us a different one, with hard-to-pronounce names. For an appetizer, we each ordered a bowl of meat dumplings that came with optional broth. We both opted for the broth. We got the bowls of dumplings and two mugs full of hot liquid at the same time. "... right as we dripped the last drop of our mulled fruit drinks from our mugs into the bowls of dumplings. Because, 'yeah, broth comes in mugs,' said both our brains. "The poor server was too stunned to offer replacements of any of it, and we felt too ashamed to ask for anything to be comped, so we assured her whatever flavor bled over was our punishment for our idiocy, and to our pleasant surprise, it wasn't too bad. "I was on vacation with my boyfriend and his buddy Ryan, visiting my boyfriend's grandmother, who lives near the beach. This beach town has a large boardwalk attraction with a locally famous small chain of French-fry 'restaurants' up and down the boardwalk. All they sell are fries, and they are amazing. "So, this particular time, we get a couple baskets of fries and sit down. On the tables are those generic red, yellow, and white plastic squeeze bottles of condiments. Unlabeled, but obviously red for ketchup, yellow for mustard, and white for vinegar. My boyfriend and I preferred our fries with just ketchup, so Ryan and grandma share a basket of vinegar fries. The vinegar bottle on our table is empty, so Ryan leans back and grabs one from the table behind him and proceeds to liberally apply it to the fries. 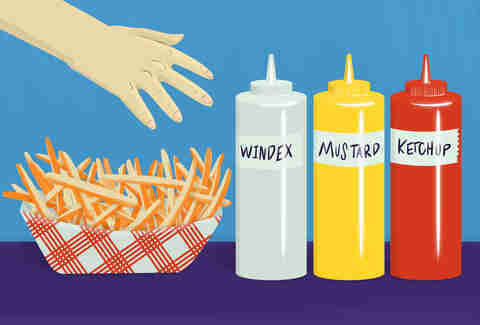 "Both of them eat some of the fries, decide they don't have enough vinegar, and squirt some more on. They still can barely taste it, and again they put some more on. This repeats several times. By this point, the fries are soaking wet and they still can't taste the vinegar. "They're about 3/4 of the way through them when a waitress comes out to wipe down a few tables next to us. This is when we discovered this place uses the same unlabeled white squeeze bottle for both the vinegar and the cleaning supplies. Ryan and grandma got through most of a basket of fries drenched in some sort of water/soap mix. "A few years ago a Japanese restaurant opened up in the small town next to mine in Western Connecticut. One night my husband and I decided to go there and try it out. I ordered a tempura plate that was described as including pieces of crab. When the server came to take our order, I inquired whether the crab was real or imitation, because I was going to order something else if the crab was imitation. The server assured me that it was real crab. "A member of the country club I worked at asked for the onions on his veal liver to be 'well-done.' The onions were already caramelized, so upon reheating them in a sauté pan, I took them as far as they could go (in my professional opinion) without being ruined. He sent it back. "I deep-fried a new portion of the caramelized onions until they were quite crisp. Again, they were rejected. Taking no chances (and some offense) on a third re-cook, I spread a new serving on a small broiler platter and left them in the broiler until they nearly caught fire. I sent out the smoking, charred remains of what had been the product of great time and labor, with an implied message of indignant sarcasm. "By the time I got to the veggies, I was basically piling it all on top of a sandwich which was never going to close. "At this point, I just did what I was told. I had to wrap the thing like it was a burrito and give him a fork from the salad bowls. He didn't complain about the £35 price either; he just paid on his card and left. In addition to collecting the usual restaurant, home-cooking, and any other food-adjacent stories, we're looking for stories of college assholes from dining-hall workers. If you have anything you’d like to see appear in Off the Menu, please email WilyUbertrout@gmail.com with "Off the Menu" in the subject line, or tweet @EyePatchGuy.